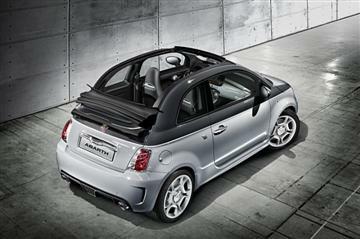 This new Fiat is coming to Australia! Already a summer sensation in Europe and now in Australia since its arrival just weeks ago, the Fiat 500C convertible turns up the heat at the 2010 Geneva Motor Show next week (4th March 2010) with the launch of the Fiat 500C Abarth, the hot open-top "bambino". While the eyes are inevitably drawn to the new two tone paint job debuted on the Fiat 500C Abarth, the extended, dynamic-looking spoiler is an instant reminder that the Abarth version of the 500C means business, a fact confirmed by 17” diamond finished alloy wheels, including the sought-after diamond finished 5 petal white wheels and its aggressive lowered stance. But the 500C Abarth is, by no means all show and no go. Under the assertive bonnet beats a new 103 kW Turbocharged engine that pumps out 103 kW, enough to blast this open-top pocket rocket to 100 km/h in 8.1 seconds and on to a top speed – where the law permits – of 205 km/h. Yet, thanks to its size, weight and efficiency, the Fiat 500C Abarth averages as little as 5.4 litres/100 km when driven along open roads in an economical manner. This performance is even more accessible thanks to a new Abarth-developed version of the Dualogic sequential manual gearbox, which has been designed to enhance driving experience of the 500C Abarth. The Abarth Competizione gearbox may be either left to its own devices to change gears or the driver can select the gears via steering wheel mounted paddles. Like a Formula One car, the Fiat 500C Abarth has LED gearshift indicators, with the added twist that when the car is normal mode, these indicate the most economical time to change gears, while in Sport mode – which also puts in the engine in overboost mode – the car tells the driver when to change gear to extract the maximum performance! The clever design of the Fiat 500C’s roof means that that this performance may be equally easily accessed to the max with the roof up or down. With the roof down, the aerodynamic design means that the pleasures of open-top motoring may be enjoyed right across the speed range without the buffeting produced by some open cars, indeed with its ability to adjust the size of roof opening on the move, the 500C allows the level of open-top motoring to tailored to every situation. With the roof shut, the level of comfort and quietness is on par with the hard-top Fiat 500, such is the acoustic performance of the 500C. With full electrical operation, as well as glass window and even a rear spoiler with mid-level brake light, the Fiat 500C roof is a masterful piece of design. The Fiat 500C Abarth is expected to arrive in Australia after the launch of its hard top 'sibling', the Fiat 500 Abarth later this year. 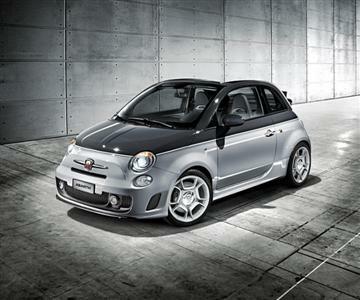 The 500C is a true Abarth, as its 103 kW 1.4 Turbo T-Jet engine clearly shows. Performance is impressive: 0-100 km/h in only 8.1 seconds and a peak torque of 206 at 2,000 rpm. It is an engine that not only delivers thrilling performance but also makes the Abarth 500C extremely pleasant to drive day in, day out. The engine is a 4 cylinder, 16 valve, unit of 1,368 cc, fitted with an IHI RHF3-P fixed geometry turbocharger. The unit delivers exciting performance, pushing the car to a top speed of 205 km/h and accelerating it from 0 to 100 km/h in just 8.1 seconds. These exceptional figures are also the result of an overboost function engaged by pressing the “Sport” button, which modifies engine control unit mapping, turbo pressure, and steering wheel loading. Yet despite its true Abarth spirit, the 500C still only consumes 6.5 l/100 km in the combined cycle. The car’s sporting yet flexible engine is also environmentally friendly and already conforms to the strict Euro 5 standards soon to be introduced. On top of its superb engine, the Abarth 500C boasts all the technical content of the model from which it is derived, including TTC (Torque Transfer Control) The most obvious innovation, of course, is the race-derived “Abarth Competizione” gearbox, fitted as standard. It was 1949 when Karl Abarth began marketing his first product, a race-derived gearbox with steering wheel control for the Fiat Topolino, capable of delivering quick gear changes in sporty driving conditions. With the same philosophy, more than 60 years later, the “Abarth Competizione” is offered as standard on the Abarth 500C. This electro-hydraulically actuated, 6-speed gearbox is operated by steering wheel paddles and controlled by a system that maximises economy and performance when driven hard. The innovative MTA-derived (Manual Transmission Automated) system is based on a conventional mechanical gearbox on which the traditional gear lever has been replaced with an actuator electronically controlled by the TCU (Transmission Control Unit) to optimise gear changes and mechanical efficiency. The gearbox can be used in two modes: auto for maximum comfort, and manual for maximum performance. “Sport” mode can be engaged in both gearbox modes and reduces gear shift times. The new “Abarth Competizione” gearbox makes driving even more fun thanks to race-derived functions like steering wheel paddle-shifting, just like on a real super-car. Further confirmation that the 500C is a genuine Abarth comes from the fact that a specific “SS” tuning kit is currently being developed specially for it, offering an even higher level of performance. The 500C Abarth is aimed at customers seeking everything the scorpion brand represents in terms of performance and innovation, plus the ultimate in style and versatility. The Fiat 500C Abarth incorporates all the safety systems already installed on the 500. Designed to conform to the strictest standards, the 500C Abarth is one of the safest vehicles in its class. Stable and effective braking, exhilarating acceleration from a 103 kW engine, and ultra-reliable. The 500C Abarth is equipped as standard with 7 airbags (two front, two window and two side airbags plus one driver knee airbag): a record for this class of vehicle. The new version is also equipped with sophisticated technical solutions to maximise active safety and control: these include ABS with EBD (Electronic Braking Distribution), a sophisticated ESP system (Electronic Stability Programme), ASR (Anti Slip Regulation) traction control, Hill Holder to facilitate starting off on slopes, and HBA (Hydraulic Brake Assistance) to help with emergency braking. The 500C Abarth also features two advanced control systems: “TTC” (Torque Transfer Control) and “GSI” (Gear Shift Indicator). TTC improves the transfer of torque from the engine to the wheels and in particular gives excellent handling on bends, making sports driving safer and more fun than ever. GSI (Gear Shift Indicator) provides a signal on the instrument panel (a LED that flashes five times) to tell you when to change gear. In Normal mode, GSI tells you that changing up will help reduce fuel consumption. In Sport mode, the signal means that changing gear will give you better performance. Finally, the Fiat 500C Abarth is fitted with dynamic systems and comfort-enhancing equipment to ensure that occupants enjoy luxury as well as safety on all types of journey. Take the suspension system for example. The front suspension is based on independent McPherson struts, while the rear suspension is semi-independent, with an inter-connecting torsion bar. Specially developed by Magneti Marelli, both suspension schemes have been optimised specifically for the 500C Abarth to ensure superb handling and the highest possible level of comfort.